Comments for Who is the impostor?? They are adorable. I often wish I had two. Our Chloe is the sweetest most lovable dog we've ever had. She keeps us entertained that's for sure. This breed is the best and I recommend Coton's quite often to family and friends. Enjoy. Just way too cute!!!!!!! Love their puppy cuts. How wonderful to have two, I can relate to the extra work and expense but so worth it. Enjoy them! They are so adorable and can learn all the good things from his older sissy. 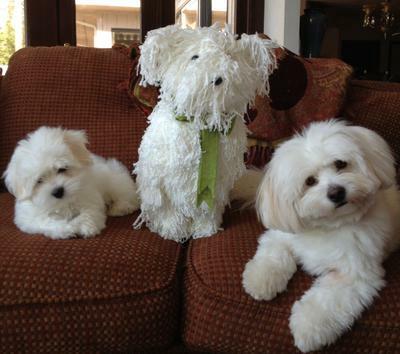 Hi Carol, we're in MD too and have one coton, Sophie. Where did you get your dogs? Thanks! Both are beautiful,such sweet expressions, our Cotons are heartwarmers. My compliments to their groomer! Come give me a break and give my Tuffy a nice trim like that please! Oh Carol..How cute is that! I'm sure you are having a ball with the 2 of them. Melody must be so happy having a canine friend to play with!! Could your dogs be more beautiful? I love all three!